Born in Shanghai on December 21, 1927 in Shanghai in the family of Simeon Mikhailovich and Zoya Stepanovna Lukyanov. He said that his ancestors from Voronezh. From an early age was under the spiritual guidance of John of Shanghai and San Francisco. The Lukyanovs' family lived in a French concession, which along with the English and Chinese constituted the division of the city. In 1934, Valery went to the Franco-Russian school, all of whose students were Russian. In 1938, after receiving his father's work in the English zone, Valery moved to study at the English gymnasium of St. Francis. In 1949, ties with the seizure of China by the Communists were evacuated to the island of Tubabao (Philippines). September 23, 1950 arrived in the United States. In 1955 he graduated with honors from the Faculty of Construction of the Brooklyn Polytechnic Institute. Received a license of a professional engineer in New York and New Jersey. Until the end of 1968 he worked as an engineer in the construction industry. On February 21, 1963, in the St. Sergius Church of the Synodal Building, Archbishop John (Maksimovich) of the Western European and Brussels, was ordained deacon. On January 15, 1967, in the Seraphim Church of the city of Si-Clif, Metropolitan Filaret (Voznesensky) was ordained priest . On November 1, 1968, Metropolitan Filaret (Voznesensky) was appointed rector of St. Alexander Nevsky Cathedral in Lakewood (New Jersey). Using his secular education of the architect, he designed and built a magnificent cathedral, a new church house, a parish school building and a house for the clergy. In 1974 he was a member of the III All-Diaspora Council. In 1975, in absentia, he graduated from the Holy Trinity Seminary in Jordanville with a bachelor's degree in theology. His influence on the formation as a pastor, teacher and spiritual leader was taught by the Holy Trinity Seminary Archbishop Averky (Taushev) and Archimandrite Constantine (Zaitsev). Since 1978 - Dean of the Eastern American Diocese. 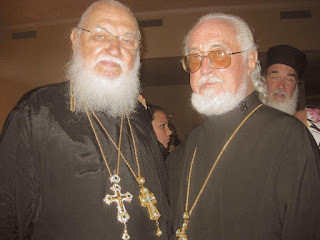 In 1986-1987, for about a year, he was the head of the Russian Orthodox Mission in Jerusalem, restored the economic and political situation of the ROCOR monasteries. In May 2006 he was a member of the IV All-Diaspora Council (as a member of the III All-Diaspora Council). O. Valery is the author of many books, the builder of a magnificent cathedral in Lakewood. He was an opponent of unification with the MP and did not commemorate her patriarchs. Only senility, he said, made him not break with the apostates. Biography of the priest includes almost the entire history of the ROCOR! And it's a pity that in the end it happened, probably it was God's admission.